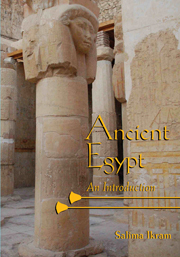 This book provides an introduction to one of the greatest civilisations of all time – ancient Egypt. Beginning with a geographical overview that explains the development of Egyptian belief systems as well as Egypt’s subsequent political development, the book examines Egyptological methodology; the history of the discipline of Egyptology; and Egyptian religion, social organization, urban and rural life, and funerary beliefs. It also discusses how people of all ranks lived in ancient Egypt. Lavishly illustrated, with many photographs of rarely seen sites, this volume is suitable for use in introductory-level courses on ancient Egypt. It offers a variety of student-friendly features, including a glossary, a bibliography, and a list of sources for those who wish to pursue their interest in ancient Egypt. Salima Ikram is professor of Egyptology at the American University in Cairo. An archaeologist of ancient Egypt, she is the author of several scholarly and popular books, including, most recently, Death and Burial in Ancient Egypt, Divine Creatures: Animal Mummies in Ancient Egypt, and, with A. M. Dodson, The Tomb in Ancient Egypt and The Mummy in Ancient Egypt. Agricultural and taxation scenes from the tomb of Nefer at Saqqara. Photo Salima Ikram. A book of this sort depends on the work of many, and I am indebted to all my colleagues, past and present, who have contributed to the field and who have made their opinions and discoveries available through the last century and a half. I am also obliged to those who have taught me and whose modes of instruction have influenced me – for the good, I hope. More specifically, I am very grateful to Janet Richards for suggesting that I write this book (and for her invaluable suggestions after reading a draft, above and beyond the call of friendship) and to Beatrice Rehl for encouraging me to do so. I am also grateful to John Swanson, Fayza Haikal, Lisa Sabbahy, Janice Kamrin, Aidan Dodson, Peter Lacovara, and a slew of other colleagues for our discussions about various aspects of ancient Egypt. I am particularly indebted to Janice, Janet, Nicholas Warner, Barbara Mertz, and Dyan Hilton for reading various versions of the manuscript – any mistakes that remain are (sadly) my own.I am very grateful to Meredith Brand for indexing aid. Most of all, I am grateful to all the students whom I have taught for helping me to form what is written in the following pages.